The pre-order for Street Fighter II: The Definitive Soundtrack will open on November 21st, 2015. To accommodate for different time zones, we will be selling the vinyl in waves for two days over the 21st and 22nd of November. If the vinyl you're trying to buy is sold out, try a different time or day. We're intentionally splitting the stock across two days so everyone gets a fair chance at a pre-order. When ordering the regular edition, please ensure that you choose the correct shipping option for your region. This helps us to ship our wares more efficiently and to keep shipping costs down. If you choose the wrong shipping option, you risk your order being cancelled. Vinyl orders are strictly limited to one copy per person and address. If you place multiple vinyl orders under the same name and address, all of your orders will be cancelled. This is to prevent resellers from buying up stock. If there are two people in your household who want to buy the vinyl separately, you will have to ship one to a different address. What are the specifications of the vinyl? The four LPs are 180-gram heavyweight vinyl, at 33⅓ RPM. There are two blue discs for CPS-1 and two orange discs for CPS-2. How fast should I purchase the vinyl? Do you have enough stock? The first pressing sold out in minutes, and while we expect the second pressing to last a while longer, please be aware of the high demand. Will there be more pressings? 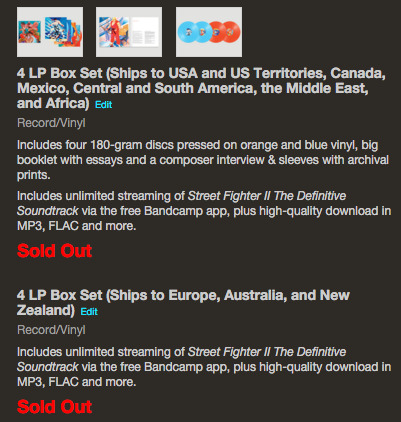 We will keep on pressing the vinyl box set as long as there's demand for it from our fans. When will my vinyl ship? Vinyl will begin shipping in Q1 2016, most likely in February and before the end of March. We apologize that we can't give a more exact date. Is there a CD and/or digital version as well? Yes, our store includes both the CD and digital versions. If I order both a CD and a vinyl, will you ship them together? Yes, but please note: If you want your CD to arrive earlier, you should place the order separately from the vinyl. If you place the orders together, then the CD won't ship until the vinyl order is ready (Q1 2016). For the most part, yes. There are certain countries we won’t be able to ship to at all due to regulations, but these are few. Please keep in mind that depending on where you live, there may be customs or import fees you’ll have to pay. Our items ship from two warehouses: Ann Arbor, MI, USA and London, UK. Can I buy this in a store? Are you working with any distributors? We’re not working with distributors for the initial run. For the time being, all goods will be shipped from our own warehouses. Who processes orders and payments? Our sales are processed through Bandcamp, while payments are done through PayPal. You can use your PayPal balance or an assortment of credit or debit cards that PayPal accepts. Does the vinyl contain sound effects? Yes. We’ve included an assortment of sound effects that we hope you’ll enjoy. Is this an official and authorized Capcom product? Yes. Capcom, the original publisher for Street Fighter II, worked closely with the folks here at Brave Wave Productions to release this officially licensed product. Why are you taking preorders for the vinyl? We’re a small and independent label, and manufacturing vinyl—plus storing the heavy stock in a warehouse with a dedicated shipping team—is a very costly procedure. We want to ensure that we don't over-stock (or worse, under-stock) the release. The album was announced in July. What took so long to get it released? We were forced to start essentially from scratch with this remaster. We recorded the entire 170-minute soundtrack from two original arcade boards, and then spent a considerable amount of time restoring the lengthy soundtrack alongside original composer Yoko Shimomura and Capcom. The vinyl version contains over 2 hours of music, so you can see how a big release like this takes a lot of time to properly produce and develop.